THIS DRESS WAS WORN FOR MY DAUGHTER'S WEDDING AND PURCHASED FOR $3600. IT IS IN EXCELLENT CONDITION, HAS BEEN PROFESSIONALLY CLEANED AND BOXED SOME OF THE PHOTOS YOU CAN SEE WHERE IT JUST NEEDS A GOOD STEAMING FROM BEING BOXED - THEY WERE JUST TAKEN MEASUREMENTS ARE 34" BUST, 28-29" WAIST, 39" HIP. MY DAUGHTER IS 5'9" SO THERE IS PLENTY OF LENGTH. THE CRYSTAL STRAPS ARE REMOVABLE, AND THERE IS BEAUTIFUL CRYSTAL AND BEADING DETAIL ON THE BODICE, BACK, AND TRAIN. IT EASILY BUSTLES FOR RECEPTION DANCING. THIS IS A CLASSIC GOWN, VERY FIGURE FLATTERING AND ELEGANT. THERE ARE BUTTONS ALL THE WAY DOWN THAT COVER THE ZIPPER. ANY QUESTIONS PLEASE ASK. Stunning Theia white gown can be worn for wedding or formal occasion. New, cardboard rosette protectors attached, rosette appliques at neckline, layered and ruffled skirt, size 6. We will be problem solvers. Sheath Style Wedding Dress Straight neck Lace Bridal Gown Court Train Elegant Simple Halter Corset Top Backless. An elegant retro look at the Sheath styleby "David's Bridal" ! Elegant, simple wedding dress at retro style, fitted bodice and natural waist, a gently pleated flared long skirt. We have a very large collection of Wedding, Bridesmaid and Evening/Prom dresses! Dress color =___ (optional). So we can know what we should do to help you. we not sure 100% it exactly as the in the picture and the quality will match the originally one. 1: If you want the dress, it will be not include any accessories such as gloves, wedding veil and the crinoline petticoat ( show on the pictures). 16:Neck circumference=_____. We will do our the best to make you the best dress and provide you the best service. A: The wedding dress does not include any accessories such as gloves, wedding veil and the crinoline petticoat ( show on the pictures). Hollow to Hem. 4,Height( from the top head to floor with your shoes on). The wedding dress does not include any accessories such as gloves, wedding veil and the crinoline petticoat ( show on the pictures). Dress Can Be Made in Custom/Standard Size ,Color, Design. No Ready-made Wedding dress! Square-Neck Mesh Sheath Gown with Allover Beading Classic/Style 87010138. A: The wedding dress does not include any accessories such as gloves, wedding veil and the crinoline petticoat ( show on the pictures). The closure of the dress: ____(Zipper or lace up back). We will do our best to solve your problem as soon as possible. The dress in in a perfect condition and never been altered. Soft, sleek and sensual in a floaty silk chiffon, Amanda Garrett's bias cut Butterfly wedding dress exudes modern beauty. Universally flattering, the Butterfly dress features an elegant, gently draped neckline with a seductive low back and fluted sleeves that continue down the back into cool silk chiffon panels reminiscent of butterfly wings. Wedding dresses bridal gowns formal prom gown. plus petite size 0 2 4 6 8 10 12 14 16 18w 20w 22w 24w 26w. you also can choose the following standard size. Standard Size. from shoulder to floor without shoes on. This is a GORGEOUS bridal gown. (I have never seen a gown with just Wedding Dress as the label before.). The gown has a sheer sweetheart neckline with lace trim at the round neck. There is NOTHING wrong with the back of the gown, the dress is just way to small for the mannequin. 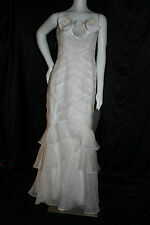 This is a beautiful gown in ivory organza. The gown is covered in beaded embroidery lace. Just so simple and elegant! Back: Zipper & Corset. Maggie Sottero Kayla Marie Diamond White Ivory Halter Bridal Gown Dress 4 6 8.